On July 4, 1991, when the legendary Minneapolis power pop punk misfits The Replacements handed their instruments to their roadies onstage at the Taste of Chicago festival to finish out the song “Hootenanny,” it was the last the world saw of The Replacements… until last night. As the clips below demonstrate, the band was having a blast onstage. In the crowd, the Toronto audience seemed to be collectively pinching itself at their good fortune, chanting along the lyrics to every song. When they next hit the stage, in Chicago’s Humboldt Park on Sept. 15, Weeping Elvis will be providing live coverage. They are scheduled to close out this three-stop reunion tour in Denver on Sept. 22. Will that be it? Will they mount a full tour or will they duck back into the musical shadows for another 22 years? There have been discussions of new original songs (the band recently completed an EP to benefit ailing former band mate Slim Dunlop) and a possible album of new material. But for now, Paul and Tommy aren’t saying, opting instead to let the music say everything that needs to be said. 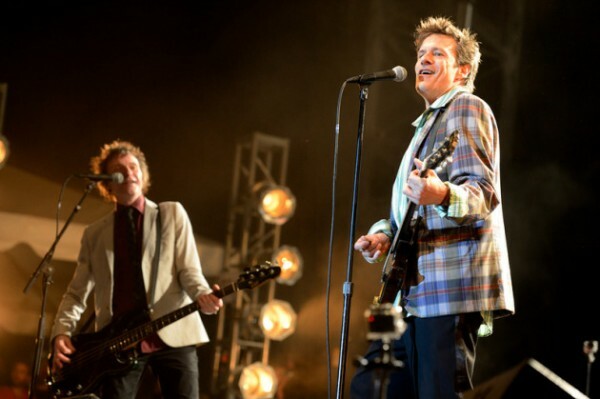 You can stream the entire show via the Replacements Live Archive Project.